Facebook Insights gives you statistics about your Facebook properties, such as pages and applications. However, you can use this tool to gain a better understanding how people interact with your website and Facebook. To install Facebook Insights for your Website go to Facebook Insights page. There’s a green button in the top right corner (Insights for your Website). 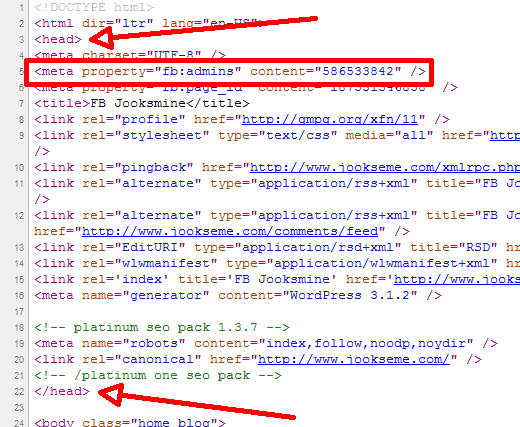 Now you need to put this code into the head part of your website’s home page. For that you need to have access to the files of your website. Open the file and paste the code somewhere between <head> and </head> tags. If you prefer that somebody else would do the code part then send the meta tag to your webmaster and tell him to put it in the head of the site. 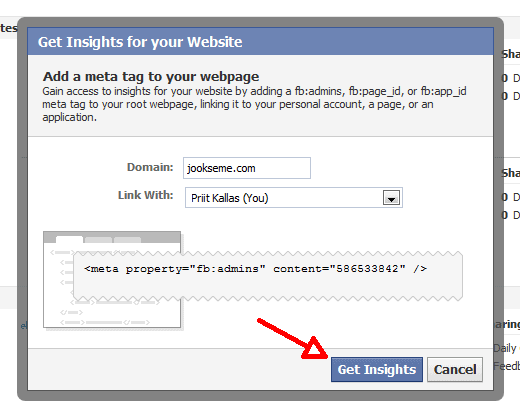 After the code is in place go back to Facebook Insights and click the Get Insights button. If it takes time for you to get the code in place then you can close the Insights page. Come back when the code is installed and repeat the steps. If everything is OK then Facebook will redirect you to the overview of the website’s insights. You will have instant access to all historical data Facebook has about your website. Like and Send button interaction, organic sharing and Comments box. Now, have fun digging through tha data and finding out what makes people like your site. For some unknown reason could not confirm admin roles. I’ll try again. Thanks Priit. I was looking for such a tool that show how users interact with my website and facebook. Does it support vb? Google Analytic Social Plugin Tracking tool is the optional of this which you also can use this to check the insight. It just launch few day ago. You should track it in order to get the accurate result of measurement. Thanks Priit – the more resources you can find to measure and define your success with Facebook (and all social media) is a big plus in defining what works.